Australian tree kangaroos are some most special animals. They are kangaroos that have returned to live up in trees. In Australia, it’s a niche relatively free from competitors and larger predators. Adaptations include longer arms and shorter hind feet than kangaroos, and a long skinny tail which helps balancing. They eat fruit and leaves, and move around foraging in tree canopies during the night. During the day, they rest up in trees on larger branches. They are usually solitary, but can sometimes be seen feeding in groups. They are territorial and males are very defensive about their territories. Australia’s two species live only in the tropical rainforests of north Queensland. They are the last survivors of a group of close relatives: fifty-thousand-years-old fossils have been found of an individual as large as today’s red kangaroo! Bennett’s Tree Kangaroo (Dendrolagus bennettianus) is almost a metre long, and weighing up to 13kg, it is Australia’s largest tree-dwelling animal. It has got orange-brown fur, grey face and black feet. It breeds all year around. Male occupies a territory of 25 hectares which covers smaller territories of several females. Female gives birth to one young which is independent after nine months but stays with mother for two years. Its species status is secure. It lives in Daintree tropical rainforests in far north Queensland in southern parts of Cape York Peninsula. 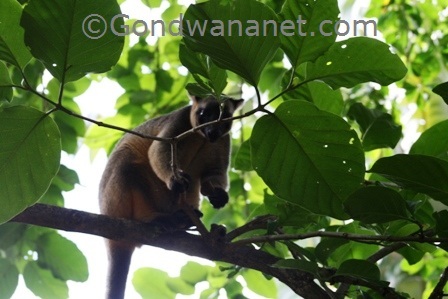 Lumholtz’s Tree Kangaroo (Dendrolagus lumholtzi) lives in southern tropical rainforests around the Cardwell range and Atherton Tablelands. It is smaller, about 700mm long and weighs up to 8kg. It has blackish brown to pale fur, and dark feet, face and tail. It mainly forages in rainforest trees, but sometimes snacks on crops near the forest edges. They are not easy to spot in the wild unless you go spotlighting night time. Good places are Daintree Rainforests and Atherton Tablelands. In Yungaburra on the Tablelands, there is a platypus viewing walk near the platypus viewing platform, where you could see some.